We will make your facility outstanding! We are proud to hear from our growing list of satisfied customers. I have been the US Army Intelligence Center of Excellence (USAICoE) Master Planner/Facilities Manager for four years. I have contracted over a hundred projects for USAICoE using many different contractors: classrooms, field training sites, parking lots, admin renovation, roofing, PT fields, security systems, etc. Approximately two years ago we began contracting almost exclusively with Cochise Tech and Electric for our classroom projects. 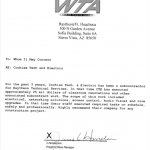 The quality of work provided by Cochise Tech is superior to any of the contractors that I have worked with. The end project is always top quality, they are flexible, completion dates are always met, costs are lower, and I trust them completely to always do great work on the varied and complex projects that are assigned to them. I highly recommend Cochise Tech and Electric. I am confident that Cochise Tech raises the construction quality around Fort Huachuca. 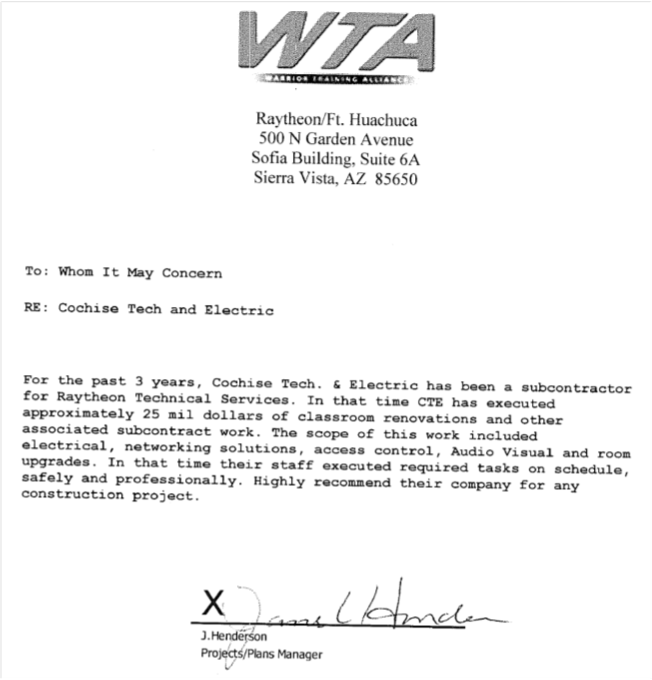 For the past 3 years, Cochise Tech and Electric has been a subcontractor for Raytheon Technical Services. In that time, CTE has executed approximately 25 mil dollars of classroom renovations. The scope of this work included electrical, networking solutions, access control, audio-visual, and room upgrades. In that time their staff executed required tasks on schedule, safely, and professionally. Highly recommend their company for any construction project. I strongly recommend Cochise Tech and Electric (CTE) for selection to commercial or domestic building projects. Over the course of the last two years, I have had the opportunity to observe the quality of work CTE provides to their customers. They have executed over $25M in classroom renovations, electrical upgrades, audiovisual installation, networking solutions, and access control integration; CTE completed each project within stringent scheduling restraints without degradation to the final product. The CTE employs highly professional staff focused on safety and customer satisfaction. 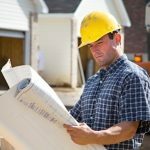 I am very pleased to recommend CTE for any construction project and am willing to provide further information on my experiences while interacting with the company. 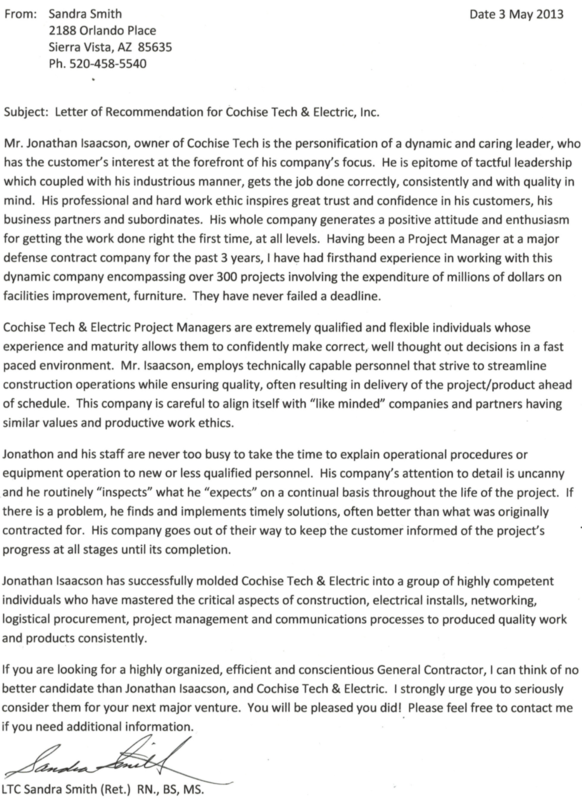 Letter of Recommendation for Cochise Tech and Electric Mr. Jonathan Isaacson, owner of Cochise Tech is the personification of a dynamic and caring leader, who has the customer’s interest at the forefront of his company’s focus. He is the epitome of tactful leadership which coupled with his industrious manner, gets the job done correctly, consistently and with quality in mind. His professional and hard work ethics inspires great trust and confidence in his customers, his business partners and subordinates. His whole company generates a positive attitude and enthusiasm for getting the work done right the first time, at all levels. Having been a Project Manager at a major defense contract company for the past 3 years, I have had first hand experience in working with this dynamic company encompassing over 300 projects involving the expenditure of millions of dollars on facility improvement, furniture. They have never failed a deadline. Cochise Tech and Electric Project Managers are extremely qualified and flexible individuals who experience and maturity allows them to confidently make correct, well thought out decisions in a fast paced environment. Mr. Isaacson, employs technically capable personnel that strive to streamline construction operation while ensuring quality, often resulting in delivery of product ahead of schedule. The company is careful to align itself with "like-minded" companies and partner sharing similar values and productive work ethics. Jonathan and his staff are never too busy to take time to explain operational proceedures or equipment operation to new or less qualified personell. His company’s attention to detail is uncanny and he routinely “inspects” what he “expects” on a continual basis thoughout the life of the project. If there is a problem, he finds and implmnets atimely solutions, often better what was contracted for. His company goes out of the way to keep the customer informed of the project’s progress at all stages untill its completion. 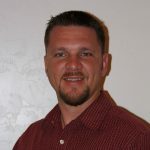 Jonathan Isaacson has molded Cochise Tech and Eelctric into a group of highly competent individuals who have mastered the critical aspects of construction, electrical installs, networking, logical procurement, project management and communications processes to produced quality work and products consistently. 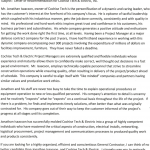 If you are looking for highly organized, efficient and conscientious General Contractor, I can think no better canidate than Jonathan Isaacson, and Cochise Tech and Electric. I strongly urge you to seroiusly consider them for your next major venture. You wil be pleased you did. Feel free to contact me if you ned additional information. LTC Sandra Smith (ret.) 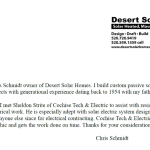 RN, BS, MS.
My name is Chris Schmidt, owner of Desert Solar Homes. I build custom passive solar residential and commercial projects with generational expirience dateing back to 1954 with my father founding this business. 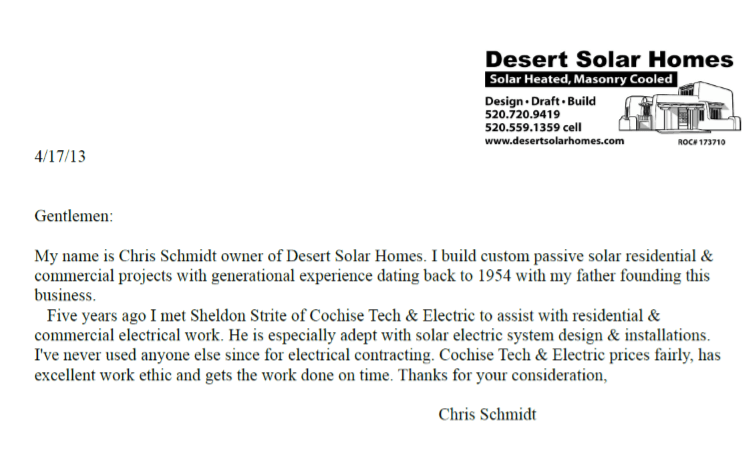 Five years ago, I met Sheldon Strite of Cochise Tech and Electric to assist with residential & commercial electric work. He is especially adept with solar electric system and design and installations. I’ve never used anyone else since for electrical contracting. Cochise Tech and Electric prices fairly, has excellent work ethic and gets the work done on time. Thanks for your consideration. © 2019 Cochise Tech and Development, LLC All Rights Reserved.